Use the pointed end of the tool to form perfect concave radius using Pearl's freezer paper applique techniques. 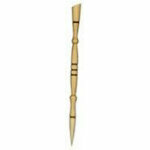 Long wooden tool makes turning under applique seam easier and smoother. Use the wide angled end of tool to press paper piecing seams or for pressing seam open.